It seems you can buy anything online these days including a sequin cushion with Nicolas Cage’s face emblazoned on it, because why not. Last year cushions and pillows covered in sequins which reveal either an image or text when you brush your hand over them was a big trend. And it doesn’t look like the trend is dying down anytime soon thanks to the wonderful world which is Etsy. 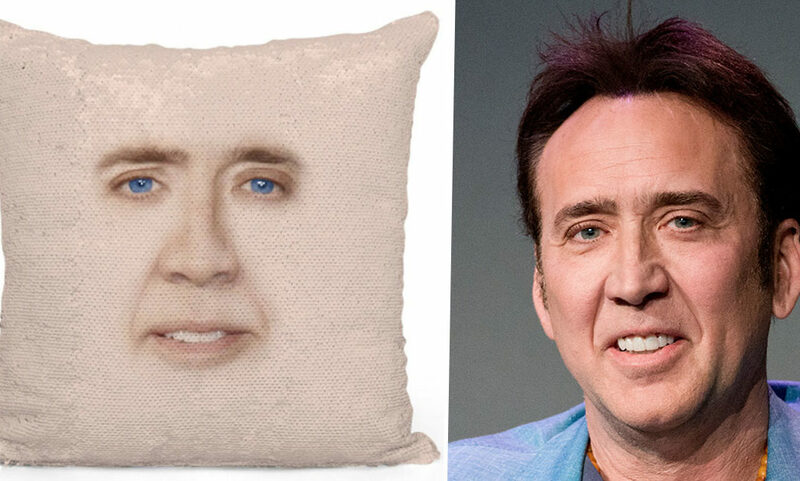 The website is filled with unique items including hundreds of sequin cushion covers or pillowcases, many of which for some reason feature actor Nicolas Cage’s face on them. 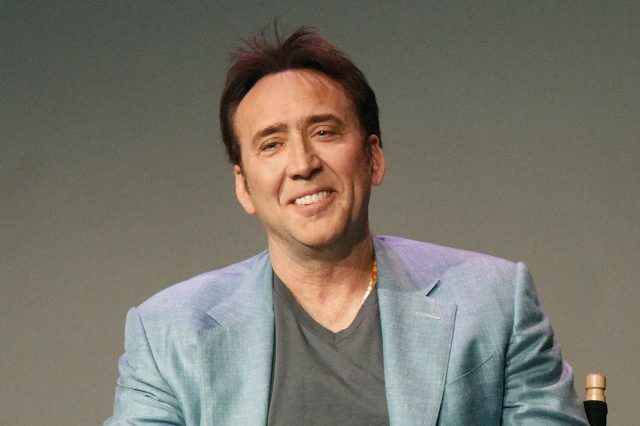 Searching for ‘Nicolas Cage sequin‘ surprisingly turns out with quite the list of results. 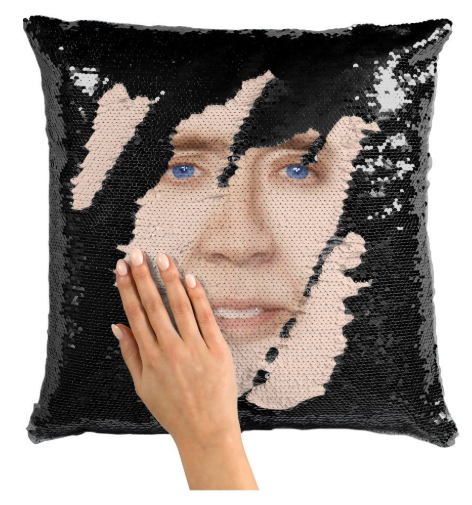 Among the dozens of listings a sequin pillowcase by company Memeskins appears to be the most popular with Cage fans, of which there are thousands eager to buy the product apparently. 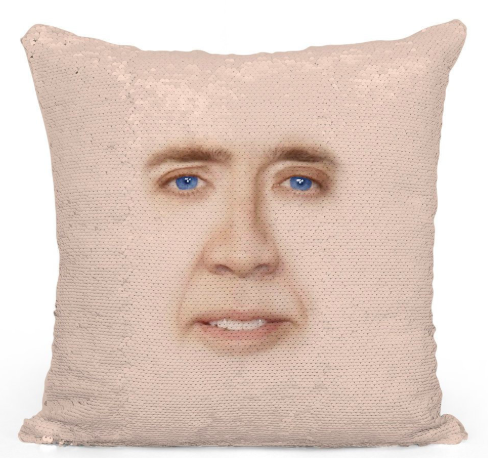 The product which is listed as ‘Nicolas Cage face sequin pillow | sequin Pillowcase | Two color pillow | gift for her | gift for him | pillow | magic pillow 10M007’ is a handmade item which measures 40 centimetres by 40 centimetres. Covered in sequins on one side, you can choose either red, black or gold sequins, when you brush your hand over them Cage’s face is revealed. 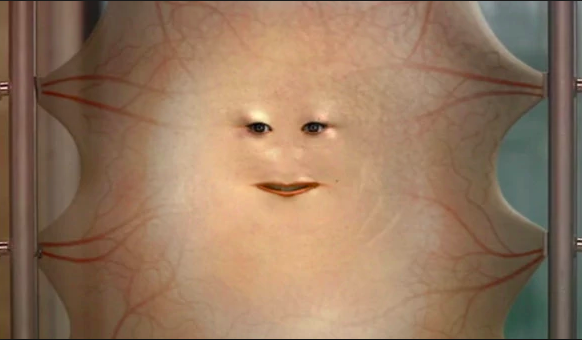 And while it is clearly Cage, he looks more like the Doctor Who character ‘Cassandra O’Brien.Δ17’, or more simply Lady Cassandra, a former human whose skin has been stretched over a frame along with their eyes and mouth. The resemblance really is uncanny. Although the product would normally set you back a whopping £24.50, at time of writing (January 10) the seller has a sale on – it is currently being sold at £19.60 saving you 20 per cent. Over 5,000 people have favourited the cushion on the Etsy shop, so I’d order one quickly in case it sells out! If you need to buy an insert pillow or cushion as well, you can select that as an option at the checkout. People clearly love the product once it arrives as the listing shows it has an average rating of five stars based on 6,781 reviews. Absolutely delighted with it! Came exactly as pictured, great quality and the sequins are sewn on very well, none coming off at all. Will definitely be purchasing from here again! Took a little long to arrive, but the pillow was amazing quality!! Unfortunately some people were less impressed at the quality of the product including Jordan Smith. The item itself is hilarious, but it took over three weeks to arrive and had no tracking info. Sequins fell off as I was trying to insert the pillow. It’ll be a funny gift but maybe not worth it. But since the vast majority of reviews or positive, if you want a Nicolas Cage cushion in your life it may be worth a purchase.